Please take a look at our Library Corner using this link below. Mrs. Johnson keeps everything updated and has great reminders this week of our upcoming Author as well as how to purchase books. 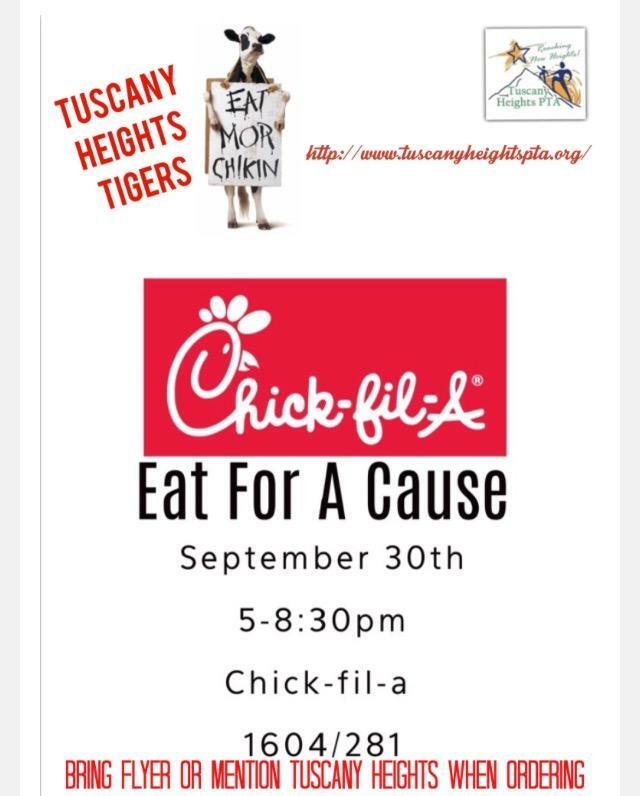 A few other reminders, Wednesday, Sept. 30th is Eat for a Cause at Chick-fil-a. See the attached flyer for details! Thank you in advance for supporting our school! Also, I have attached a flyer for Girl Scouts and Synchronized Swimming if your families are interested. ​Please find the attached weekly eBlast message for this week. We have a new idea this year for Learning Labs! Please see the attached flyer because we are still looking for parents that would like to be a part of this learning experience for our students in all grade levels. Thank you in advance for those that have volunteered! We would love for you to consider it if you haven't. Thank You for not only being a part of your child's education, but also being involved for all of our students. Below you will also find two fliers from our high schools. Please find our weekly EBlast attached. Let's dress in our red, white and blue for Sept. 1tth tomorrow. Have your family join in the recognition of honoring those impacted by the 9-11 tragedy. Thank you for standing strong for our country! On another note, standing strong, we have student leaders that are diligently working alongside of our staff preparing for a Leadership Community Event on Tuesday, Sept. 15th. In an effort to show the community, to GO PUBLIC, we are inviting other schools and community members to come see some of our student leaders at work. We have specific students that will be kicking off the two hour event, some that will be giving guided tours, and some involved in classroom activities. We are working on showcasing the quality of leadership we have here at Tuscany versus quantity in the interest of time. All of our classrooms have leadership roles and great things happening. A few have volunteered to join the tour for this event. You are welcome to join us as parents, community members, but please know that the tour may or may not be in your child's classroom. Thank you for understanding that we wanted to focus on the quality of leadership versus the quantity of leadership roles happening at THE. If you can't make it to this event, ask your student leader, what role do you have at Tuscany? All of our students are involved in setting goals, rotating or participating in classroom leadership roles, and/or applying for/receiving campus wide roles. We can't wait to share our leaders with the community on Tuesday, Sept. 15th. Don't forget PICTURE DAY TOMORROW! We loved having all of the grandparents in the building on Friday. Thank you for sharing them with us because they truly are the root to our Tiger Family. If you were unable to have your grandparents attend, have them check out our website and teacher webpages to find out all of the great things happening here. We are thrilled to embark on another week Tuesday, Sept. 8th. Please take part in keeping your children motivated in setting and achieving goals they have for themselves. Ask them about their leadership notebooks? You can really see how they are “Putting 1st Things 1st” and challenging themselves to show growth. We love our student leaders! We are excited as a school community that in the recent article, Tuscany Heights Elementary was voted in the Top 10 San Antonio Schools based on distinguished and diverse criteria. *Again, a new eBlast format coming soon (one page template that will come as an attachment). Tuesday, Sept. 15th- International Dot Day/Leadership Day at Tuscany (More info coming) * Wear your polka dots, circles, etc to help us celebrate! T.H.E. PTA ONLINE STORE IS STILL OPEN! – You can still go online and order your THE Spirit Gear, donate to Greenbacks, join PTA, order your directory, directory ads and shout-outs, etc.! Go to www.TuscanyHeightsPTA.org and click on the WELCOME BACK section! Some quantities are limited so order today! Box Tops Contest September 16-30 - Begin with the end in mind and start collecting NOW! Winning class will get to have some snow ball fun thanks to Bahama Buck’s TPC location AND Everyone who brings in 25 Box Tops will receive a coupon for a free small snow cone at Bahama Bucks…It’s a BLIZZARD IN SEPTEMBER! 09/16-09/25 HEB Bonus Box Tops! Buy 10 Box Top products, get 60 box tops, buy 15 Box Top products, get 100 box tops! Or buy 3 or more Box Top products in one trip at Sams Club between now and next summer, take a picture of the receipt, send it to samsclub@btferecceipts.com and receive a code to enter online. Earn 100 or more bonus eBox Tops! Lost and Found – Be proactive! Parents please remember to label commonly lost items with your child's name. This will help us get items that have been left behind back to their owner in a timely manner. Commonly lost items include: lunch boxes, beverage bottles, sweaters and backpacks. All items left unclaimed will be donated during Christmas break and at the end of the school year. Directory Info - Do you have a business you want to advertise or a special student that you want to tell how much you love them? Advertise or buy a tribute or shout out in the Tuscany Heights directory! Info was in your welcome back folder or you can contact Susan at directory@tuscanyheightspta.org. Wacky for Khaki! – Be proactive this year by collecting new school uniforms and underwear for our sister school-East Terrell Hills! Look for the donation box in the entryway 8/17-9/30. *Uniforms in sizes 4-14 and underwear in sizes 4-8. We are off and running with planning the 6th Annual Run For The Heights. We are always looking for energetic volunteers starting now leading up to the big event. Opportunities vary in talents, interests, and time but include coordinating staff/neighborhood running groups, securing items for the goody bag donations, securing the 5K award packages and medals, entering race registrations, & coordinating the new VIP Tiger Tent. Please contact Jennifer Bissen at runfortheheights@tuscanyheightspta.org to see where you can help out or come to our next planning meeting on Wednesday, 9/23 @ 9:30am in the Room 207 (PTA Room upstairs in 5th grade hallway). Check out the website to view event details or photos from last year. Plug in with PTA and Back the Future!